So.. what are you making? Oh lordy, are they asking me again? I was just here two hours ago and they asked me that. I spend way too much time at the local fabric store and they ask me "what are you making?" EVERY SINGLE TIME! Perhaps if I wasn't in there 3 times in a week, it wouldn't bug me. But, do they have to ask me that EVERY SINGLE TIME! Is it part of the "procedure", like wearing flair, are they instructed to ask me that question? 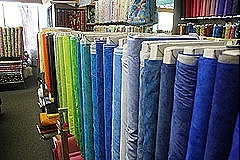 Do they ask me that question each and every time because working at the fabric store bores them out of their mind? Beth and I have ruminated on this many times. I really want to say, "none of your damn beeswax", but instead just mumble " it's for the stash". But I just keep it to myself… god-forbid I should get banned from the local JoAnn's. OH MY GOSH…THIS IS MY PET PEAVE. I hate it when they ask and especially if it’s for an altered art project they have NO idea what I’m talking about anyway. It just PAINS me to have to explain. “For the stacsh”, is actually a good answer, but the other’s are even better! Actually reusable sanitary pads are all the rage with the green and younger crowd. With me…not so much. I have a different view – They probably have seen some of your work at some point and if they are like us they want to see! You are so creative that if I was working there I’d ask every time too! They have you in person and don’t have to see what you are making through a blog! Its a compliment! For sure! hahaha! I love the reusable pads answer!! But I also like the “probably just a mess” tooo funny! That’s so funny – I hate that question, too! I think I’m just not big on any kind of small talk. LOL! The sanitary pads comments would definitely give them something to talk about in the break room!! Well, WAY back in the day, my senior year of HS (1979), I was a clerk at Cloth World, and I think your “working in a fabric store bores them out of their minds” comment probably comes the closest to the truth…but not for me, at least not most of the time. I was a fabric junkie even way back then. When I asked the question, (and I did for sure) it was out of genuine interest. Everything about fabric projects facinated me and I wanted to know and learn. I now don’t like mindless idle chit chat from clerks at all…I just want help when needed, simple pleasantries, and a smile and I’m good. Tell them I need this last yard for that Space shuttle cozie! Same thing here, then they want me to bring the stuff in…not a chance. The same thing happens to me at JoAnns and I’m in there a lot so it is annoying. I had to laugh the other day though when the lady cutting my fabric started to ask me that and halfway through the sentence she cut herself off and said “Oh I know you. You’re the lady that makes the dog totes for charity.” Ha, ha. I have started telling the staff at Joanes “I haven’t decided yet” when they ask what I am going to be making with the fabric I am purchasing! HA! I’ve noticed that, too! I always say I don’t know….maybe I should come up with something original! lol I may want to use something someone has said in the comments! Very funny! I got asked that every time at the upsscale sewing center. It irked me too. They never told me what they were making, but then, I didnt ask. I wasnt interested in what women THEIR age were making. Hummmph! “like wearing the flair” LOL! Maybe if you wear some flair the next time you go in, they’ll ask you about THAT instead! LOL Ooh, and the suspenders would be too funny! So funny! Good to know I’m not the only one who is bugged by this question every single time it is asked!! My problem is: I never know what I’m doing, so how could I tell them! this is just hilarious! I love it!